Milwaukee, Wis. – December 3, 2017 – Associated Bank recently provided $20.6 million total equity and $11.5 million total construction/bridge financing to Gorman & Company Inc. for the development of three Wisconsin affordable housing projects – two in Milwaukee and one in Sheboygan – with a total of 130 apartments. The developments used Low Income Housing Tax Credit (LIHTC) equity as part of the financing package, requiring that apartments be available at below-market rents to people earning no more than 60 percent of their area’s median income. Two of the projects, which are historic building renovations, also qualified for federal and state historic preservation tax credits that cover rehabilitation costs to preserve the buildings according to National Park Service standards. Associated Bank partnered with Boston Capital to provide the equity investments. Washington School Apartments, 1238 Geele Avenue, Sheboygan The former Washington School was built in 1912 and is on the National Register of Historic Places. The building will become a two-story apartment community with 42 apartments consisting of seven one-bedroom, 26 two-bedroom and nine three-bedroom units, the majority of which (35) will serve low- to moderate-income families. Fifth Street Senior Apartments, 2770 N. 5th Street, Milwaukee This three-story historic school building will be renovated into 48 apartments consisting of 12 studio, 29 one-bedroom and seven two-bedroom units for seniors aged 55 and older. Forty-four units will serve those earning 30, 50 and 60 percent of area median income. Washington Park Townhomes, 1500 and 1542-1546 N. 32nd Street and 3131 W. Galena Street, Milwaukee This new construction of 40 two-story townhouse-style apartments will include 26 two-bedroom and 14 three-bedroom units for those earning 30, 50 and 60 percent of area median income. Additionally, several units will be targeted to veterans and their families. Common amenities will vary among the three projects, but all will include a community room and on-site leasing office, in addition to access to supportive services. 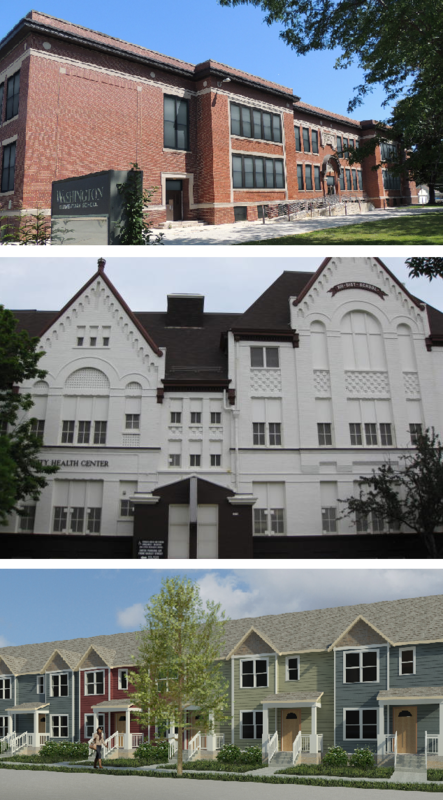 Since 1984, Gorman & Company has worked to revitalize communities through innovative housing partnerships, specializing in downtown revitalization, the preservation of affordable housing, workforce housing, and the adaptive reuse of significant historic buildings. “We are pleased to deliver a full banking solution to Gorman & Company in the form of debt, equity and grants and to support high quality affordable housing in Milwaukee and Sheboygan. This brings the total number of affordable housing units financed through Associated’s Community Development Corporation to over 1,500 in under three years,” said Charles Cafazza, senior vice president and Director of Investments for Commercial Real Estate. Bryan Schreiter, vice president in the Commercial Real Estate division of Associated Bank originated the loans. Associated Bank’s Commercial Real Estate division is committed to providing commercial real estate developers, owners and/or operators with an array of financing solutions, in addition to products and services that meet their unique needs. The division has offices in Illinois, Indiana, Michigan, Minnesota, Missouri, Ohio, Texas and Wisconsin.